Proverbs says, “Reckless speech is like the thrusts of a sword, but the tongue of the wise brings healing” (12:18, TLV). Speak Life helps readers speak words of restoration to God, themselves, and those they love. Brady Boyd has done it again. In Speak Life, Boyd writes about something that every one of us can understand on many levels; the power of words and conversations. Boyd writes from a pastor’s heart. And by this, I’m not suggesting that he writes as a guru, an expert, or a know-it-all. Rather, he shares with raw honesty and vulnerability; but through it all, he faithfully points people to Jesus, the scriptures, and ultimately, to a more intimate relationship with God. Have you ever said something you wanted to take back? At some point, we’ve all been careless with our words. But the truth is, the quality of life we live depends on what we say. 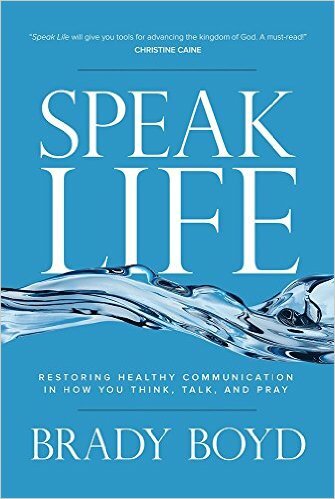 In Brady Boyd’s new book, Speak Life, he addresses this topic with clear and practical biblical answers. I know you’ll be challenged and inspired as you learn to speak words that bring life. Brady Boy brilliantly excavates Jesus’s conversational style. Discover how to look, sound, and act more life Jesus as Speak Life positions you to ‘speak life’ into any situation. Your communication habits will be radically transformed. Brady Boyd has written another really helpful, down-to-earth book. Open to any page and you’ll find practical wisdom that speaks straight to where you are. I absolutely love this book! God has given Brady Boyd incredible revelation about the power of words and how they should be used to build and enhance eery relationship in our lives – including the way we relate to God and ourselves. This book is a must-read for everyone! It will truly change your life and increase your potential for success on every level. We all now the power of the right word spoken at the right time. Words like that can turn a bad day around or even change a life. When it comes to speaking the right words at the right time, no one did it better than Jesus. What if we learned to speak like him – to have the sorts of conversations that helped people meet with God? That’s what Speak Life is all about. I’m excited for my friend Brady’s new book because, in my experience, we could all stand to sound a little bit more life Jesus! The wonderful gifts we draw fro Speak Life are wisdom and experience for developing excellent relationships. Of course, the Word of God is the foundation of this valuable work, which is a genuine treasure for those of us wishing to develop a wholesome communication with our heavenly Father and those around us. Thank you, Brady, for helping us rediscover the power of our words! Speak Life is a fantastic weapon to put in your artillery against the Enemy. It will equip you to go to new levels in your spiritual walk an give you tools for advancing the kingdom of God. A must-read! Brady Boyd ‘nailed it’ in Speak Life. After reading this book, my understanding of some personal choices I need to make smacked me right between the eyes. The insights you will discover about the crucial conversations in your life will make you a stronger believer, a better person, and a more effective leader. Put this book on your ‘to read now’ list, and buy a copy for the people you love the most. We are all spread too thin, taking on more than we can handle, trying to do so much—almost as if we are afraid that if we were to take a moment of rest, we might discover that all our busyness is covering up an essential lack in our lives. But God never meant for us to be so busy. God desires for us to have rest and peace. Brady Boyd shows you how to live a life that embraces stillness and solitude, so you can find the peace that God wants for you. Like everyone who is running hard and fast after Jesus, I am reminded by Pastor Brady that rhythmic patterns of life are essential to do the strenuous work of the gospel. May we fight for a Sabbath rest in our ives so that we will be reinvigorated to continue to push forward in our destiny and purpose. I know what this addiction is all about, and I know the cost I have paid for it too. These words will help you get free from one of the most ‘sanctified’ bondages in the church. The relief alone is worth it. 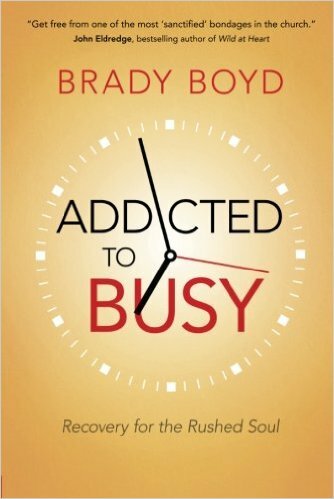 Addicted to Busy is packed with biblical insights and practical steps to help you establish a rhythmic life. Read it and embrace the joy that comes from staying in tune with your Creator. Let her be her. And let her be heard. For Pastor Brady Boyd, these are the two main wishes for his young daughter and the world she’ll encounter as a woman. 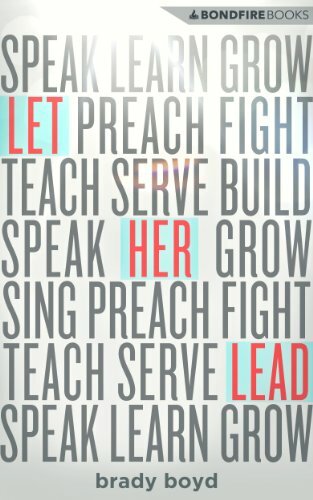 In Let Her Lead, Boyd calls on the church and the wider world to let women be who they are and speak their voice with confidence and conviction. The question of women in leadership remains touchy for many people, especially church people. In this brief and engaging book, Boyd defuses the tension by offering a fresh, practical, and biblical perspective and revealing the leadership roles women play at New Life Church in Colorado Springs. Through it all, Boyd imagines a bright future that could be awaiting his daughter and what she may be invited to do. And he shows all of us—men and women alike—the roles we can play to create that better reality. I’ve walked the halls of Brady’s offices hearing his female staff members rave about how he lets them lead. I’ve also walked the halls of corporate America, wishing for more men like Brady who would let women lead. This small book is big on wisdom for the church and the marketplace. I am really glad that my friend Brady Boyd decided to write this book! So many books that deal with controversial topics try to score points or win a debate, but that isn’t what Brady does here. He simply wants to see what the Bible says about women in leadership. He deals with this very sensitive issue with understanding and love. What he finds is so encouraging—this is a book that everyone should read. The role of women in the church has long been a confusing and hotly debated subject. In Let Her Lead, Brady Boyd passionately tackles this subject with both delicacy and insightful truth as he shares stories from Scripture and his own life. He takes an in-depth look at what God’s Word has to say about women in leadership and skillfully applies it to our lives and culture today. You’ll be challenged and inspired as you look at leadership from a whole new perspective. Let Her Lead is a long-overdue book that deals with an issue that has haunted the church for centuries. It’s time for the church to get it right as it relates to a woman’s role in marriage, the church and society. As this book heals wounds in the hearts of women, it will bring understanding to the minds of men. Brady Boyd delivers a refreshing and uplifting take on the role of women in ministry. His words are expressed with such common sense and compassion that it begs the question of why such gender issues exist in the first place. Through scripture, personal experience, and rational consideration, Let Her Lead paints the picture of the competent, insightful woman in the professional world. Women of God have such great influence over the direction their church takes and the lives of its members, and this book will make it clear once and for all just how crucial is the role women play in the modern church. Whether her calling is to raise a family or to make crucial executive decisions, this enlightening read will inspire the women of the church to embrace their talents and use them to value any ministry, whatever those talents may be. In the years following the senseless and tragic shooting on the campus of New Life Church in northern Colorado Springs, Colorado, Senior Pastor Brady Boyd has received countless questions from the faith-filled and faithless alike. As the nation watched the suffering congregation reel from the gunman’s rampage and, later, steady their stance once more, the one question on everyone’s mind was, “How has New Life weathered such a horrible storm so well?” In Fear No Evil, Boyd answers with eloquence and grace, paving a path toward hope to anyone walking through the “valley of the shadow of death” and is tempted to camp out there. This story of tragedy and triumph will release you from life’s common traps of doubt and despair. Whether you are a parent who has lost a child, a single mom who feels overwhelmed, a middle-aged man starting over after bankruptcy, a student trying to make sense of life and the world at large, or simply someone who wonders where God is in the midst of your suffering, the considerations and counsel offered here will serve as a lifeline for your soul. This book will break your heart and then put it back together again. It’s an amazing testament to the way hope endures even int eh midst of life’s greatest tragedies. Fear No Evil tells the heart-wrenching tale of a church that was battered with tragedy but refused to be defeated, and a leader whop perseveres knowing that the Lord has not left him. Brady Boyd is an example of absolute faith, one whose obedience and unfaltering focus on God’s will cannot be shaken. In Fear No Evil, we plunge with Brady and his congregation into the depths of the Valley of the Shadow of Death…literally! But, as promised, the gates of hell do not prevail, and from the heartache and brokenness, God brings healing, restoration, and… new life! This book is life changing! Brady Boyd is a vibrant, vital voice rising today – speaking with substance and solidity. His disarming simplicity brings a clarity and practicality that will encourage and refocus you. Brady Boyd urges believers to cling to truth a world that continues to give us trails. He exposes his own life journey with vulnerability in detail through hardships of church shootings and unexpected transitions. This book is an inspiration for believers to remain steadfast while running our life race with courage. We must fight for faith to hope and trust our heavenly Father, who gives the ultimate direction. In this marathon of life, Fear No Evil cries the message of truth to keep us running hard and looking to Jesus, the finisher of our faith. My personal observation of Pastor Brady Boyd in the moment of the shooting crisis at New Life confirmed to me the deep inward character I knew he had when he was recommended to be their senior pastor. I stood and watched as he looked down upon the bloodstains on the floor and walked out to face an army of media at the church entrance. He was calm, poised, compassionate, Spiit-led, and full of God’s authority. His humble leadership not only settled a shaken church, but also restored to broken families who had both lost children to the devil’s devices. Read this book with settled knowledge that God works in crisis and that the end result is that our lives, our characters, and our families will be stronger in the struggle. I have been close friends with Brady Boyd for over twenty years and sere as an overseer of NewLife Church. I have personally witnessed the incredible courage and Christian character demonstrated by Pastor Brady and the congregation of New Life as they faced tribulation and tragedy with triumphant faith. This is a book that had to be written to tell a story that will inspire all who read it. Few churches will ever be asked to endure tragedy at the lvl New Life Church experienced on December 9, 2007. But, God is never caught off guard, and he put my friend Pastor Brady Boyd there for just such a time. Now Brady has written an incredible account of how Go’d amazing power can overcome tragedy and fear with forgiveness, worship, and joy. Using practical, firsthand stories that offer helpful, portable takeaways, Pastor Boyd looks at the interweaving of his journey from spiritual orphan to treasured son, offering candid stories and freeing insights for every Christian still longing to come home. The truth is, many of us as Christians still strive to “fit in” with God even when our Father offers us the identity of beloved daughters and sons. We’ve already been admitted, approved, and accepted—but we aren’t living that way. In Sons and Daughters, Pastor Boyd looks at the interweaving of God’s grace and our daily lives: How do those who know they are God’s children think, speak, and act differently? How do they function as leaders and friends? How do they walk through pain? You—and the purposes God has for you—are a cause for celebration, a reason to be both fearless and faithful. Come discover how to live like you belong. Brady Boyd presents us with a marvelously accessible, enjoyable, and practical procession off life-as-it-is anecdotes and applications that breathe truth, life, and refreshing. His lucid, grace-filled, and pungent style is at once touching, convincing, instructive, and inspiring. Brady Boyd explains the joy that comes from being a child of God and the frustrations that we all face. Through heartfelt testimonies of struggle and redemption, he shows just how precious it is to embrace our relationship with our heavenly Father. Songs and Daughters will challenge the reader to understand their place in the kingdom of God and why it is so important to fight for it. Too many Christians believe they i.e. That says you have to earn God’s grace. It is a free gift! Receiving that gift makes you a true child of an incredible Father. 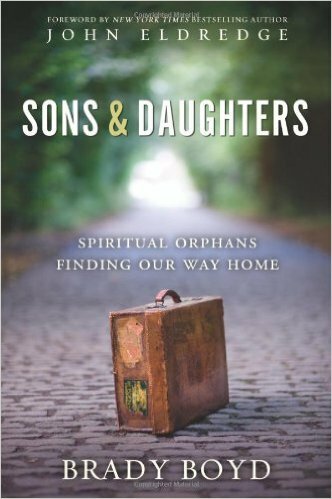 In Sons and Daughters, my friend Brady shows how you can stop living as a spiritual orphan and start living as a son or daughter of God. When you receive that revelation, it will change everything. This amazing book is a must read for all, but especially for those who struggle with their identity as a child of God. Brady Boyd captures you by the candid stories out of his own experiences and freeing insight. As pastors of Oasis Church in Los Angeles, my husband Philip and I find that we are half parents and half pastors to our congregation. It is an interesting place to be. Many in our church are in their twenties and thirties, looking for spiritual parents – which reflects an entire generation that hope to find their place and fulfill their purpose in history. In this book Brady Boyd takes us on a journey of receiving that all-important blessing from our Father. Rather than live as orphans, we can walk confidently into the future God has in store for us. I can’t wait for our congregation to read it! Brady Boyd’s Sons and Daughters is a tremendously moving book. We are all spiritual orphans seeking our way home in one way or another. 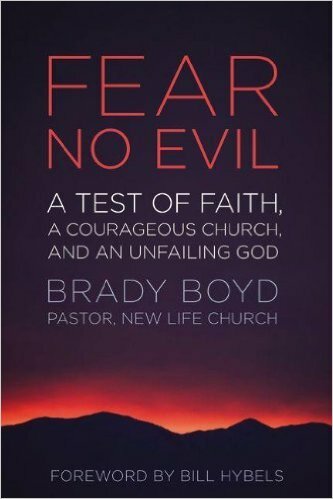 In this book Brady shares moving stories, showing us that we are already accepted by God, enabling us to live both fearlessly and faithfully. I highly recommend this book to anyone seeking answers to living life more abundantly. I have long known Brady Boyd to be a man of deep spiritual insight and remarkable sensitivity to God’s voice. I trust him. That’s why I was not surprised to discover that Sons and Daughters is filled cover-to-cover with transformative glimpses of God’s Father-heart for me (and you). I believe we live in a day in which most believers suffer to some degree from an ‘orphan spirit.’ Brady has not only penned a beautiful, biblical invitation to ‘come home,’ but has handed us a map that shows the way. Having spent most of my childhood starved of the love and influence of an earthly father, the plight of orphans is very close to my heart. Brady Boyd’s gentle and wise words about the transition from spiritual orphan to treasured child of God are like a healing balm for anyone who’s ever longed for a place to call home.